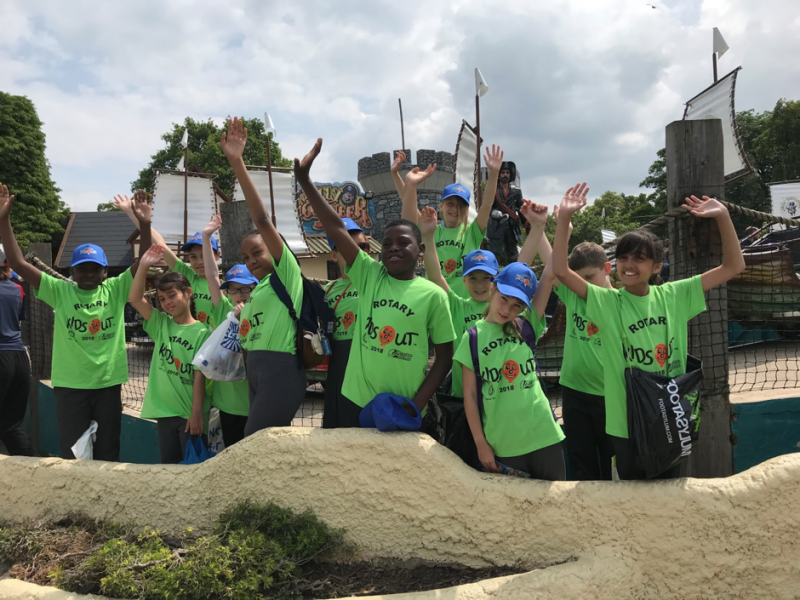 This really is a ‘Bumper Bundle’ Issue – Please read on..
Have you read the latest (August) edition of Rotary Magazine, and the Rotary KidsOut article entitled ‘Sunshine Days’? A very BIG ‘Thank You’ to everyone involved in the annual National Rotary KidsOut Day on 13 June 2018, having received main reports and seen updates on ‘social media’, it was not only the children that enjoyed their day out! We are pleased to say we achieved a RECORD BREAKING 30,477 children having a great day out, WELL DONE to ALL involved. NB: On-Line Registration is now CLOSED, However IF you still need to register for the above retrospectively, please contact me without delay. Whilst this event if possible should be held on the first Tuesday in December each year, appreciating that given the availability of venue and children, then this target date is flexible. A number of Clubs and Districts have already been involved in the Festive Fun Day for the past 2/3 years and it is hoped to expand the FESTIVE Day Out so even more children can enjoy a festive great day out, perhaps meeting Santa, going to a Pantomime/ show, sing-a-long, Fun Fair, Indoor Zoo, Farm etc. KidsOut are pleased to advise they will offer a subsidy of £5.00 per child especially for the Festive Fun Day, plus FREE Baseball caps if required. Rotary KidsOut Baseball Caps: These are issued free of charge (one size fits all), and if required should be ordered separately, giving at least 4 weeks’ notice in advance of the event. See link below. Following on from last year’s Rotary KidsOut Festive Fun Day Free Pantomime Tickets in both Birmingham and London, KidsOut are pleased to announce that for this year’s festive period, there are 2 ‘Pantomime’ offers. then order your tickets ADDING ‘ELF ROTARY’ or ‘PAN ROTARY’ in the voucher code at checkout. This will get you £10 off an Elf ticket and £5 off a Peter Pan ticket from normal adult prices. Further discounts do not apply to already discounted children’s (under 16 yrs. old) tickets. Incredibly, the producers will match 1 free ticket for every ticket you purchase using the discount code above to KidsOut, who will provide refuge children the opportunity to see the show which otherwise they could never afford to go. For many it will be the first time they have ever been in a theatre. This offer is much the same as last year, except this year it is available at 6 locations (as above) namely: Belfast, Birmingham, Cardiff, Leeds, Manchester, Nottingham, with each venue having an allocation of 400 FREE tickets, except Belfast will have 200 FREE tickets. As yet full details are still to be confirmed, but it is likely that the free tickets may only apply to specific timed performances on certain days. It is particularly important when ordering tickets, that you ensure any allocated should be specifically for children who would not normally get the opportunity to see a top class ‘spectacular’ Pantomime. Please ensure you only order what you can practically use. In an effort to ensure even more children can avail themselves of a Rotary KidsOut Day Out / Festive Fun Day, and I am pleased to advise that we now have a Rotary KidsOut ‘Ambassador’ in 12 Districts, namely D1040, 1060, 1070, 1090, 1120, 1130, 1145, 1180, 1210, 1220, 1230, 1240. Has your District got an ‘Ambassador’? Whilst this is great news, and will no doubt help to coordinate more, bigger and better Rotary KidsOut Events around RIBI, we still need more ‘Ambassadors’. IF you are interested, then please contact me without delay. KidsOut CEO Gordon Moulds is available to attend District Conferences as a Speaker. In addition, should your Club or indeed District require a KidsOut Speaker to address a ‘local’ meeting, please contact me to discuss details. ‘Spread the Word’ Please forward a copy of this email to your club colleagues, to ensure they too are updated with ‘Rotary KidsOut’. Additionally, why not take a look at the KidsOut website? As always, should you have any comments or queries, please do not hesitate to contact me, I am here to help. Again ‘Thank You’ and your Club for your continued support, please carry on the good work.